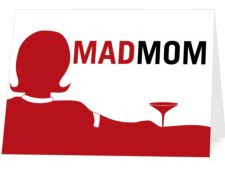 This Penn supermom is "cooking on the edge of insanity"
Mother's Day is Sunday, May 8 and while you should certainly get mom a card (these are my favorite), I've got a fun, inexpensive suggestion to go along with that card from Penn alum and supermom blogger Emily Rosenbaum (C'95, Grad Ed '96). Over the past year, I've covered Emily and her experiment where she didn't serve herself an actual meal, but ate whatever her 3 kids left behind on their plates. Emily is that mother; you know, the one who avoids chemicals, minimizes food waste, shops locally, fears sugar, hides from corn byproducts, and tries to convince her son that lemonade is not a fruit. Don’t even get her started on BPAs. Six years after making her first batch of muffins, she’s not just pureeing squash and baking bread. She’s forming little lumps of chicken-apple-spinach mush into nuggets, coating them in homemade breadcrumbs, and lovingly brushing them with olive oil. She is poised on the edge of craziness, unless she toppled in last Tuesday. 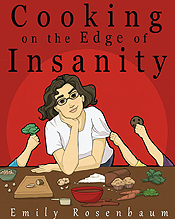 In her recently released fifty-page memoir, Cooking on the Edge of Insanity , Rosenbaum shares recipes and tells the tale of living sustainably while cooking for a family of five. Don’t bother to tell her she’s nuts. She already knows. After the jump, check out what happens when she takes her three children to the grocery store and ends up developing a new couscous recipe. Gift your mother with this book for Mother's Day HERE !